US researchers have successfully tested a brand-new, battery-powered, ten-engine, remotely piloted aircraft that is able to take off like a helicopter and fly like an airplane. A prototype of the Greased Lightning GL-10 with a ten-foot wingspan (3.05 meters), developed by NASA researchers, has been recently tested at Fort A.P. Hill military base in Virginia, not far from Langley Research Center in Hampton. The GL-10, which is currently being designed and tested, was first envisioned as an unmanned aerial vehicle (UAV), with a 20-foot wingspan (6.1 meters). But the scientists decided to start with smaller versions and various prototypes. "We have a couple of options that this concept could be good for," said Bill Fredericks, an aerospace engineer, in a statement. "It could be used for small package delivery or vertical takeoff and landing, long endurance surveillance for agriculture, mapping and other applications. A scaled up version – much larger than what we are testing now – would make also a great one to four person size personal air vehicle." 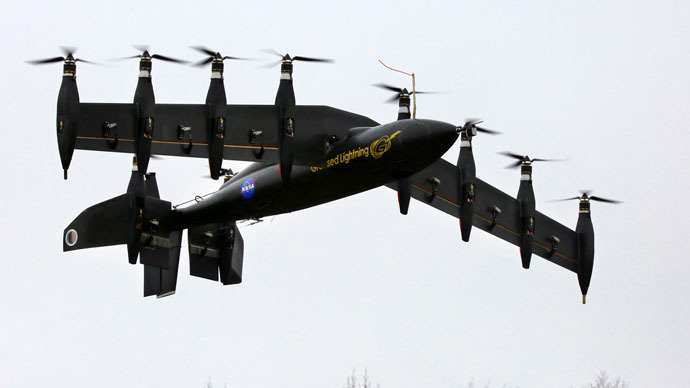 The recently tested prototype, sporting ten electric motors on its wings and tail, weighs 62 pounds (28.1 kilograms). Following the hover tests, its ability to change from helicopter-styled, vertical flight to forward "wing-borne" flight was examined. "We built 12 prototypes, starting with simple five-pound (2.3 kilograms) foam models and then 25-pound (11.3 kilograms), highly modified fiberglass hobby airplane kits all leading up to the 55-pound (24.9 kilograms), high quality, carbon fiber GL-10 built in our model shop by expert technicians," said aerospace engineer David North. "Each prototype helped us answer technical questions while keeping costs down. We did lose some of the early prototypes to 'hard landings' as we learned how to configure the flight control system. But we discovered something from each loss and were able to keep moving forward." Zack Johns, the GL-10's primary pilot, said the aircraft has a significant advantage in that it resembles a three-engine plane in terms of control. "All four engines on the left wing are given the same command," said Johns. "The four engines on the right wing also work in concert. Then the two on the tail receive the same command." Another major advantage is the lack of noise produced by the plane. "It's pretty quiet," said Fredericks. "The current prototype is quieter than a neighbor mowing the lawn with a gas-powered motor." The GL-10 is to be presented at the Association for Unmanned Vehicles Systems International 2015 conference that will take place in Atlanta this week.